Hello my friends. I will be updating the blog every day during the month of September with a new taco truck review. So there's not any confusion, I won't be eating from a taco truck every day. Some days I may hit up more than one, some days will be an off day. As food bloggers will attest to the hardest part about food blogging is actually the blogging, not the eating. Hey maybe I will eat from a taco truck everyday! who knows! But since there is no way for you the reader to know there is no point to suggest such a thing. I am imposing three rules on myself. 1)I must have the review posted each day before midnight(duh). 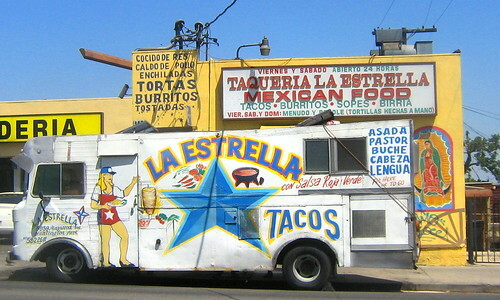 2)I must order at least 3 tacos from a each truck. 3)I cannot review a taco truck that I have already reviewed. So send me your taco truck tips! (or leave a comment here). If you see a taco truck that I haven't reviewed let me know it's location. I'm going to need your help with this my fellow taco hounds. If I fail I will be the laughing stock of the food blogging community. But Bandini you say, you already are. Haha! Thanks a lot! The last thing I need is to have my confidence shaken on the eve of my taco journey. Hey, what the hell am I doing still sitting here? I better go get some tacos!